At Cornerstone Dental in Hillsborough and Green Brook, our focus is on your total dental health, with treatments provided by some of the most experienced and respected dental professionals in New Jersey. 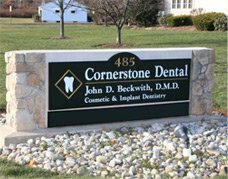 Dr. John D. Beckwith, along with our team of experienced dentists and staff members at Cornerstone Dental in New Jersey are committed to providing you with exceptional comprehensive dental treatments. We offer general, restorative, and cosmetic dentistry treatments that are designed to correct dental issues, improve the appearance of your teeth, restore the health of your gums, and prevent any future problems from occurring. With luxury treatment facilities, personalized dental care, and the skills of an experienced dental team, part of our mission is to see that you are given the best possible care in a first-class, comfortable environment. From porcelain veneers and teeth whitening to dental implants, Invisalign®, and routine dental care – the dentists at Cornerstone Dental are exemplary practitioners who are dedicated to giving each of our patients precise, effective, beautiful results. Please take a look through our website to find out more about our practice and the procedures we offer, and contact us today to schedule an appointment. Dr. Beckwith, a Diplomate of the American Board of Oral Implantology and Fellow of the International Congress of Oral Implantology, utilizes our comprehensive in-house diagnostic tools to develop a custom dental implant treatment plan for each patient. The combination of his experience, superior credentialing, and use of computer-guided technology help achieve unprecedented results. Therefore, fewer appointments, a shorter recovery period, and the most predictable outcome possible can be attained. At Cornerstone Dental, we offer start-to-finish dental implantation to optimize your convenience, comfort, and results. Dr. John D. Beckwith has been a practicing dentist for more than 25 years. A member of the Academy of Cosmetic Dentistry, the International College of Oral Implantology, and other prestigious organizations, Dr. Beckwith is a distinguished dentist who offers treatment in cosmetic dentistry, restorative dentistry, and more. Dr. Arlene O’Brien is a member of the American Dental Association and the Academy of General Dentistry. She has spent years refining her skills to become a top-level dentist with an assured and gentle hand. At Cornerstone Dental in Hillsborough, our focus is on your total dental health, with treatments provided by some of the most experienced and respected dental professionals in New Jersey. For comprehensive information about implant dentistry, please visit our specialty website dedicated to dental implants.